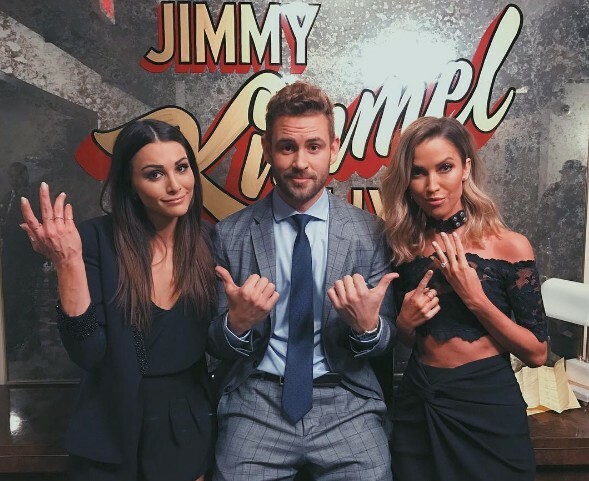 It seemed all good in the hood when former Bachelorette leads Kaitlyn Bristowe and Andi Dorfman joined their mutual runner-up Nick Viall during an appearance on Jimmy Kimmel to promote Nick’s season of The Bachelor. The thought of this made me feel awkward given Kaitlyn and Nick’s history, but also because of Kaitlyn’s rocky history with the Bachelor franchise. Kaitlyn infamously spoiled her own Bachelorette season when she accidentally posted a photo with her in bed with her winner/fiance Shawn Booth. So I was pretty surprised when she was back in the fold promoting The Bachelor. Well, that was short-lived since Kaitlyn ranted on Twitter about Nick getting the opportunity to be on Dancing With the Stars. The last lead from the franchise to appear on DWTS was Chris Soules and many people credit the demise of his Bachelor engagement with Whitney Bischoff to being on Dancing With the Stars. And many past Bachelor leads have warned their successors from following in their foot steps since the show is rough for a new relationship. So it wasn’t super surprising when the last three series leads did not go on to the ballroom. Well, apparently there’s more to that. Bachelor Spinoff Bachelor In Paradise To Air This Summer! ABC crushed my trashy TV loving heart when Bachelor Pad was canceled last summer. I mean, the only reason to watch Bachelor and Bachelorette, which are both beyond stale, the past several years was to anticipate who will end up on the sleaze fest called Bachelor Pad. The racial discrimination lawsuit against the Bachelor and Bachelorette has been dismissed by a judge. Christopher Johnson and Nathaniel Claybrooks claimed racial discrimination after they auditioned for the show in April. As a result, they filed a class action lawsuit against ABC, Warner Horizon Television, Next Entertainment, NZK Productions, and creator Mike Fleiss. Christopher and Nathaniel drew attention to the fact that neither show has ever featured a person of color and the majority of contestants vying for roses have been white. The pair's lawyers argued that the producers of the Bachelor needed to respect the Civil Rights Act and other anti-discrimination laws. In addition, Christopher and Nathaniel wished to force the Bachelor to have persons of color as finalists. Judge Aleta Trauger ruled in favor of ABC and granted their motion to dismiss the lawsuit. "The Shows' casting decisions are part and parcel of the Shows' creative content, which the plaintiffs seek to reform. That is plainly an attempt to regulate the content of the Shows, which the First Amendment forbids," Judge Trauger ruled. "In this respect, casting and the resulting work of entertainment are inseparable and must both be protected to ensure that the producers' freedom of speech is not abridged." REPORT: The Bachelor Sued For Discrimination! Plus Courtney & Ben To Wed and PHOTO Emily’s Bachelorette Portrait! It seems the most homogeneous dating pool in America will soon get a wake-up call! Shortly after Lamar Hurd started a campaign to become the first black Bachelor in the franchise history, two other African-American men have decided to file a class action lawsuit against the show for discrimination! According to TMZ, the two plaintiffs attended a casting call in a Nashville Hotel to audition to be the next Bachelor. Christopher Johnson, one of those men—who also happens to be an aspiring NFL player—claims when he arrived the producers asked him why he was there. Apparently, that’s when the discrimination began. Christopher and another African-American applicant, Nathaniel Claybrooks, claim they were then taken to the side of the room and excluded from the normal audition process. Neither man received a call back and both believe it is because of their race! In response, they have filed a class action lawsuit today in federal court against ABC, Warner Horizon Television, Next Entertainment, NZK Productions and creator Mike Fleiss. More details will be coming this afternoon and Reality Tea will keep you posted on the developments. In other news, Ben Flajnik and Courtney Robertson continue their campaign to convince people they are in love. Hey, getting married following The Bachelor comes with a hefty reward – lifetime infamy! And likely some monetary pay-offs as well. Indeed, the two were spotted at Mark Zunino’s recent wedding dress fashion show – which of course totally proves this wedding is happening, like tomorrow, and not that the couple is pretending to be in love for fame and publicity as some reports have claimed. “They sat in the front row and were holding hands the entire time,” Courtney a friend reveals to HollywoodLife. “They looked really happy and very much in love. During the show, Ben played with Courtney’s hair and she was giggling and pointing to the different wedding dresses.” Apparently, when and if she weds, Courtney will be sporting a Mark Zunino gown. Ok, then. And finally, with Emily Maynard‘s season of The Bachelorette premiering next month, ABC has released the first glimpse of her portrait. PEOPLE got the exclusive. Emily looks stunning, of course, and is obviously holding a bunch of roses! The portrait is below! The Bachelorette premieres May 14th at 8:30/9:30 EST on ABC. IS THE LAWSUIT AGAINST ABC AND THE BACHELOR VALID? DOES THE SHOW DISCRIMINATE? WILL COURTNEY & BEN GET MARRIED – OR ARE THEY IN LOVE WITH PUBLICITY? CLICK THE CONTINUE READING BUTTON FOR EMILY’S PORTRAIT! Report – Bachelor Contestants Planning To File Class Action Lawsuit Against Show! According to a report, past Bachelor and Bachelorette contestants have had it with the show’s super strict rules and are not taking it any more! The coalition or planned class action lawsuit rather is being led by Jesse Csincsak, winner of the Bachelorette season 4 with Deanna Pappas. In an interview with CupidsPulse.com, Jesse reveals he and other show contestants have spoken to attorneys and are in discussion to file the lawsuit against the show’s creators Mike Fleiss and Elan Gale. Jesse, who does a lot of interviews/blogs posts about the shows and even hosts Bachelor(ette) events, reveals the last straw for him came when Gale contacted his business partners and other companies telling them not to work with him. Jesse adds that the producers have also contacted former other show contestants threatening to blacklist them if they participate in any of his events. Jesse, who is now married to former Bachelor contestant Ann Lueders, explains how the planned class action lawsuit came about. “I had planned to file my own lawsuit last month but after discussions with numerous people and former Bachelor contestants, we realized that this issue is much bigger than me,” he said. Yikes, this is certain to get ugly. It, however, appears Jesse and others have a real shot at winning this case as back in 2003, the show’s producers sued former Bachelor Season 4 star, Bob Guiney, accusing him of violating his contract by promoting his cd and music video. Bob ended up winning that case. It was also reported last month that the show filed a lawsuit against Steve Carbone, who operates the site RealitySteve.com, known for revealing pretty accurate spoilers about the show. The lawsuit alleged Steve was offering contestants financial incentives to break their show contracts. TELL US – THOUGHTS ON THIS PLANNED CLASS ACTION LAWSUIT? SHOULD THE CONTESTANTS BE ALLOWED TO MAKE A LIVING OFF THE SHOW AFTER THEIR SEASONS END? Jon Gosselin Talks Kate, Girlfriend & TV, Plus Kate Gosselin Dating Show? Former Jon & Kate Plus 8 dad Jon Gosselin is currently on his fourth girlfriend since leaving his ex-wife Kate Gosselin less than a year ago. And while the world continues to wonder how the douchebag father of eight does it, Jon is gushing about his new girlfriend, Ellen Ross, in a new interview with UsWeekly. In other news, the web was buzzing this week with news that Kate Gosselin might be getting her own dating reality show ala The Bachelorette. First an “insider” said the following to Life&Style magazine. “Kate’s working on a deal to do a new reality dating series on ABC,” said the insider. “Kate would love to have someone in her life. She really misses the companionship. She wishes she had a man around to help her out.” The rumors then grew legs when the Bachelor/Bachelorette creator Mike Fleiss told Ryan Seacrest that Kate could indeed be the next Bachelorette. Kate’s people however shut down the rumors, telling EOnline.com that the reports she scored her own dating show on ABC — pairing her with single dads — is “not true.” Hmm, something tells us if the price is right, we will be seeing Kate on the next season of the Bachelorette. The Bachelor fans are free to rejoice once again as ABC will be announcing the new “Bachelor” on Tuesday, Oct. 13 live on Dancing with the Stars. The host of the show, Chris Harrison, also confirmed this news via his Twitter page. The show’s producer, Mike Fleiss, had previously confirmed the next Bachelor would be one of the contestants from Jillian Harris‘s recent Bachelorette season, even narrowing the choices down to three men. “When the new season of The Bachelor premieres, look for Reid, Kiptyn or Jake to be handing out the red roses,” said Fleiss. There are however rumblings that the new Bachelor could be a new contestant all together. Our previous polls showed a preference for Reid as the next Bachelor. The new season of “The Bachelor” will premiere in early 2010; with all signs pointing to Monday, Jan. 4, though the actual premier date has yet to be confirmed.